Flying Burrito Co. | Welcome to The Burrito! Welcome to The Flying Burrito Company! It’s been about fifteen years since we opened the first Flying Burrito in a refurbished warehouse just off Dickson Street in Fayetteville. 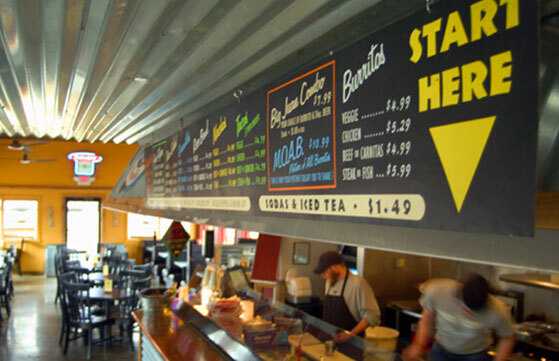 Since then, the demand for the world’s best burritos, tacos, quesadillas, nachos, and salads have led to the opening of four more Flying Burrito locations in three cities across Northwest Arkansas, resulting in thousands of happy customers, and billions of happy tastebuds across the state. We take great pride in offering the best, freshest ingredients in all of our menu items so that your custom-made creation is fresh and delicious when you visit one of our stores. All of our menu items are made right before your eyes, to your specifications, to make sure that yours is just the way you like it, every time. We want to thank everyone who has made Flying Burrito Company what it is today, and look forward to serving you many, many burritos (or tacos, nachos, quesadillas, whatever) for years to come. We hope to see you at one of our locations very soon. Stop by for lunch, dinner, an afternoon snack, or let us cater your next party or event with one of our famous taco or burrito bars!